Central Italy is visited for its famous cities and towns, such as Rome, Florence, Pisa and Siena, as well as for the beautiful countryside of Tuscany and its lesser known but equally lovely neighbour, Umbria. The coasts of both the Mediterranean and the Adriatic boast some of Europe's best resorts and finest beaches. Florence is, for many, the jewel in Italy's crown. The city is so blessed with ancient buildings, museums and art galleries as to be almost overwhelming. 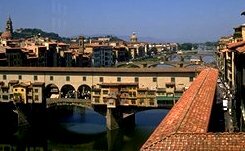 The highlights are the Cathedral (il Duomo), the Palazzo Vecchio, the Uffizi musem, the Ponte Vecchio (pictured), and more works of art than can be even hinted at here. 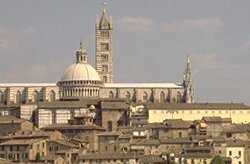 We can only recommend as long a stay as possible and a good guide book to get the most from this beautiful city and the lovely Tuscan countryside around. 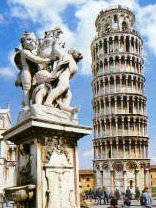 The leaning tower of Pisa, recently re-opened to the public after work to prevent any further leaning, remains one of the wonders of the world, especially given its setting in the Piazza del Duomo, a beautiful square containing the Cathedral, the Baptistry and the Composanto. The rest of the old town is worth a stroll, and be sure to visit nearby Lucca, where you can wander in the walled town and feel part of a byegone age. Rome, the Eternal City. Around every corner lies a new marvel of the ancient Roman age. There is so much to see. Many walks have been designed to cater for all interests, and there are guided tours galore. Make sure you don't miss the Trevi Fountain, the Spanish Steps, the Coliseum and the Catacombs. Take in the Forums, the Vatican, and admire the views form one of Rome's seven hills. Before you leave, stroll down the Via Veneto for some window shopping and a cappucino while you watch the world go by. 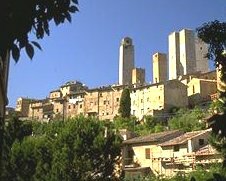 In the heart of Tuscany is San Gimigniano, town of towers. A beautifully preserved medieval hill town, where street minstrels fill the air with music and new panoramas open with each corner turned. The countryside is dotted with medieval villages, and the famous Tuscan cypresses perfume the air. This is, quite simply, one of Europe's most beautiful areas. Siena basks in the sunshine, its brown-hued buildings giving the town a distinctive warmth, gloriously offsetting the black and white marble of its magnificent cathedral. The narrow streets give suddenly on to the vibrant space of the square, the Piazza del Campo, famous for the twice-yearly Palio horse races, when the residents of the local districts compete against each other in a thrilling and colourful spectacle. Rimini is perhaps the best known of the many resorts along the Adriatic coast of central Italy. Its superb sandy beach and many attractions make it an ideal spot for a family holiday. The Mediterranean coastline is more varied, and the resorts are more focussed on watersports and boating. Nevertheless, sandy beaches abound, especially around Follonica and near Rome, where excellently-equipped camp sites cater for families. Take a day-trip to Elba, site of Napoleon's exile, or step back in time by driving to the peninsular of Argentario and strolling among the fisherman's houses of Porto San Stefano.